Display a list of donors. This can be used to show donors for a specific campaign or for all campaigns. To manage your widgets, log into your WordPress Dashboard and go to Appearance > Customize. Open up the Widgets panel (in certain themes, this panel may be named something else) and add the Donors widget. Number of donors to display. Order by: Order donors by how recently they donated (most recent shows first) or by the amount they donated. Show donors by campaign: Display donors who donated to any campaign or limit it to show donors who donated to a specific campaign. 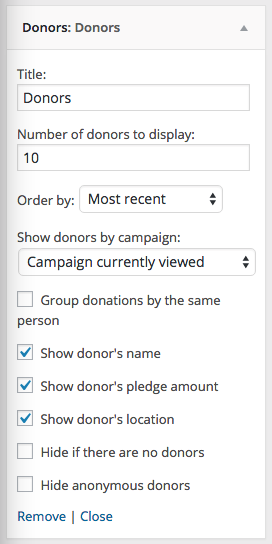 Set to “Campaign currently viewed” to just show the donors for the current campaign on individual campaign pages (the widget will be hidden on all other pages). Group donations by the same person: Choose whether multiple donations by the same person should be grouped together, or whether to show the same donor multiple times. Show donor’s name: Tick the box to show the donor’s name. Show donor’s pledge amount: Tick the box to show how much the donor gave. If multiple donations by the same person are grouped, this will show the total amount donated. Show donor’s location: Show the donor’s city, state and/or country. Hide if there are no donors: Tick the box to hide the widget when there are no donors yet. Hide anonymous donors: Hide donors who chose to donate anonymously. Requires Charitable Anonymous Donations.